The new technology could serve as a platform for growing human tissue outside the body that could eventually be used to repair or replace failing human organs. A platform known as AngioChip could take tissue engineering to new heights as a group of researchers from the University of Toronto have created a new unique method for growing human tissue in a lab in conditions that can mimic the human body. Their design was modeled after electronic microchip technologies that carry electricity similarly to how blood vessels carry blood. "Growing blood vessel networks in tissues has always been a challenge because they are so structurally complex," says Boyang Zhang. Zhang is a graduate student at the university and lead author on the paper detailing the group's work. "But we know we can pattern very complex electronic circuits, so why can't we use the same principle to pattern blood vessels? This is why we wanted to make a chip that has these built in blood vessel networks that can carry blood just like how electronic circuitry carries electricity." So from the inspiration of a microchip, Zhang set out to build a scaffold out of POMaC -- a biodegradable polymer that is also biocompatible, meaning it won't harm living tissue. He then built the scaffold in layers, carving out a pattern of channels roughly 50 to 100 micrometers wide, each layer modeled after computer microchips. The layers are then stacked to form a 3D structure of synthetic blood vessels that are bonded to the layer below through the use of UV light. Zhang says the entire process was created in their laboratory, known as 3-D stamping. "The biggest challenge was actually building these chips," Zhang said. "We invented the technique known as 3-D stamping to make these very small and intricate structures that resemble a blood vessel network." Once the process is finished, the group then takes the entire structure and place it in a liquid containing living cells that can quickly attach to the channels of the structure and begin to grow, just as they would in the human body. Through this technique, the group has managed to build model versions of heart and liver tissue that function just like our own. They can even connect the two model versions to simulate real interactions between the two organs. Zhang says that in the immediate future, AngioChip has some serious potential when it comes to understanding how human tissue interacts with certain drugs and medication. Most drug-testing techniques involve animal testing or costly clinical trials. AngioChip could provide a realistic model for drug companies and researchers to test for potentially dangerous side effects without harming human or animal test subjects before their products hit the market. The technology could even be used to test the effectiveness of drugs, and potentially lend itself to actual organ replacement. "The short term goal is to apply this technology to drug discovery," Zhang says. "But the long term goal is to apply it to tissue regeneration or organ replacement. To apply this technology to organ replacement, we will need to automate the method we used to make these chips, so we can create a larger version of these chips." For now the team still creates each AngioChip by hand. As Zhang mentioned, the group is focused on developing a method that can produce many copies of the structure at once. 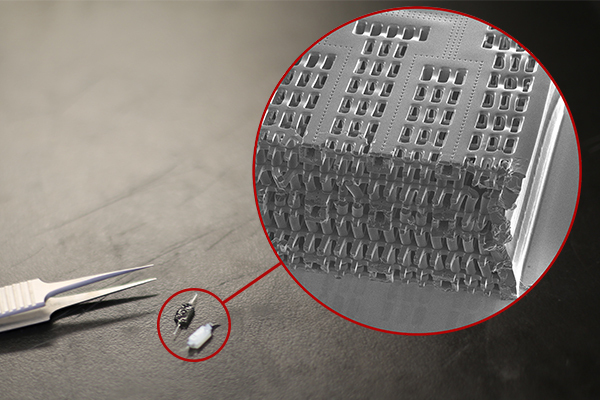 Even now, given that the technology was made from a biodegradable polymer scaffolding, the chip could be implanted into a living animal, connect to its circulatory system, and eventually the surrounding scaffolding will biodegrade into the body naturally.